Alcoholic & Non-Alcoholic Cider Beverages for Halloween, Thanksgiving, Any Time! Take a sip of cider and close your eyes. Surely there is no taste that is more evocative of New England on a clear, crisp, golden autumn day. 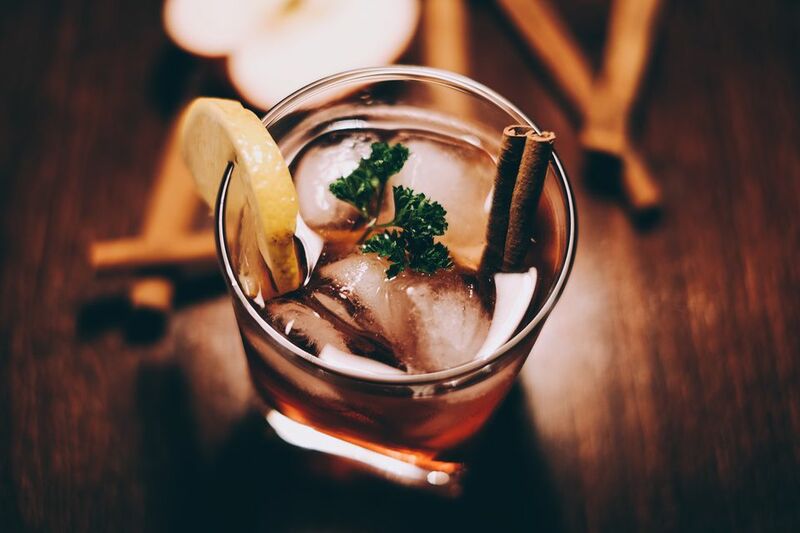 Whether you're looking to mix some impressive apple cider cocktails to impress company, to warm your insides after a brisk hiking outing, to serve a special beverage at your Halloween or Thanksgiving party or to concoct a punch for the kids, these alcoholic and non-alcoholic apple cider drink recipes are sure to remind you of days spent in New England. Of course, my biased opinion is that they'll all taste best with fresh New England cider. Apple Cider Au Pear, a crisp cocktail featuring pear brandy, from professional mixologist Michael Snyder. Allspiced Cider, a fragrant holiday warmer from RecipeLand. Apple Pie Martini, like dessert in a glass, from Navan Vanilla Liqueur. Buttered Rum-Spiced Cider, a classic recipe from Betty Crocker. Cider and Tequila Hot Toddy, a colorful concoction from Recipezaar. Cider Martini, a classic fall cocktail from martinilovers.com. Hard Apple Cider, and old-fashioned way to drink apples, from Recipe Cottage. Hot Apple Cider Streudel, a warm, sweet drink you'll love, from professional mixologist Michael Snyder. Hot Buttered Cider, with rum, spices and rich buttery smoothness, from Flora's Recipe Hideout. Mulled Cider with Calvados, garnished with Granny Smith apples, from epicurious. New England Apple Cider & Bourbon Cocktail, an attractive drink with a kick from The Buggy Blog. The New England Express, an effervescent, alcoholic punch, from Bon Appetit. Hot Mulled Cider, an autumn favorite, from the kitchen of New England contributing writer Kim Knox Beckius. Cider Snap, with dissolved Red Cinnamon Candies, from Recipezaar. Hot Mulled Cider in the Microwave, a quick and easy option, from Cooks.com. Hot Raspberry Cider, a fruity delight, from the Michigan Apple Committee. Notchland "Muddled" Cider, an orange-infused variation on mulled cider, from The Notchland Inn in Hart's Location, New Hampshire. Simple Hot Spiced Cider, from The Spruce's Diana Rattray. Sparkling Cider, a fun mocktail for kids, from cdkitchen.com. Wassail Punch, a traditional German beverage, from Allrecipes.com. If you want to pour autumn in New England into a glass, try this cocktail recipe from Hotel Vermont Head Bartender Nick Roy. First, you'll need to make pumpkin bourbon, which requires a bit of patience. "I grilled off pumpkin skins and infused them with Smugglers Notch bourbon and let that sit for two weeks," Roy says. Another secret: "I also used Urban Moonshine maple bitters to give it that fall spice aromatic," he says. Shake ingredients with ice, and strain into a martini glass. Garnish this pumpkin cocktail with cinnamon powder, Roy suggests. Your friends will be impressed. Cook with Apple Cider: It's Not Just for Drinking! DC Cocktail Week: Don't Miss These Food and Drink Specials!